A few weeks ago, my foodie friend Kenny told me about a food blog called whiteonricecouple. I thought the name was silly, but if he thought the recipes were good, then I might as well try it out. Turns out they have tons of great recipes! I have so many bookmarked, but this is the first one I finally made. It is so easy! I realized last night our nectarines were going to go bad soon, so at 9pm I decided to make cobbler and by 10:15, we were eating it! And it was delicious. Sooooo good :) You can find the recipe here. -then add the room temperature butter. You can use a stand mixer if you have one, or since I didn’t I just used a spatula and elbow grease to mix it all together. It should turn into a smooth dough. -bake in preheated oven for 25-30 minutes until nicely brown. -reduce the temperature to 300 degrees and bake for 30-40 minutes or until center of custard is no longer wobbly. 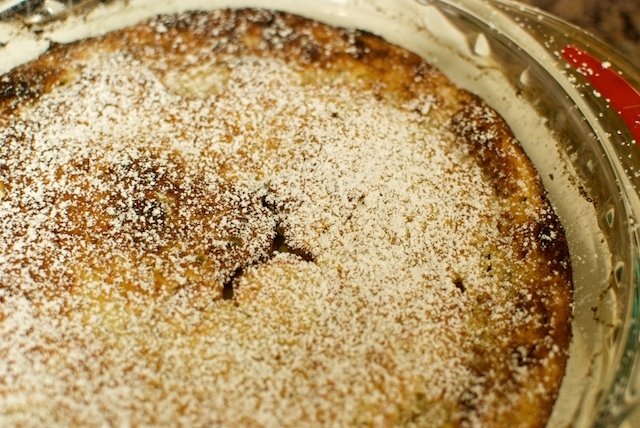 -you can add a little powdered sugar on top if you want, but it’s plenty good without it. I’ve never been very into seafood. Some people love it, but I always thought of seafood as having this oddly weird smell and texture. Recently, however, Drew and I have been trying to limit the amount of meat in our diet and so I’ve started to cook more seafood for protein. It’s important to us, though, that the seafood we eat is sustainable and caught in a way that limits the harm done to the environment so we’ve been trying to follow the recommendations from the Monterey Bay Aquarium. I buy most of our meat from Whole Foods, even though it’s pricey, they have a good selection of local organic chicken, beef, and pork. They also have fresh seafood, though you have to read the labels to see which are sustainably caught. Last weekend, I bought some Wild Alaskan King Salmon. 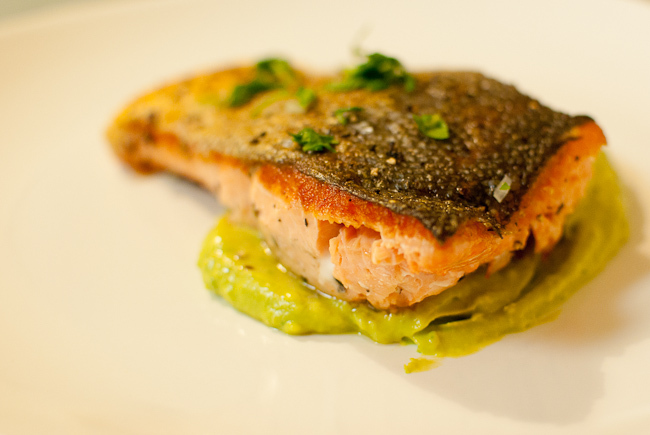 I had never cooked salmon but this was I dare say one of the yummiest things I have ever made! It was tender, moist, and so flavorful! King salmon has much higher fat content than other kinds of salmon, and I did feel it was a bit too rich towards the end of my meal, so next time, I think I will try a different kind. *the trick to keeping it moist and tender is to slow cook it under low heat conditions in the oven. It will come out looking not really cooked, but take small knife, insert it into the fish and it should come out easily. The recipe is so simple, I’m not even going to list the ingredients. 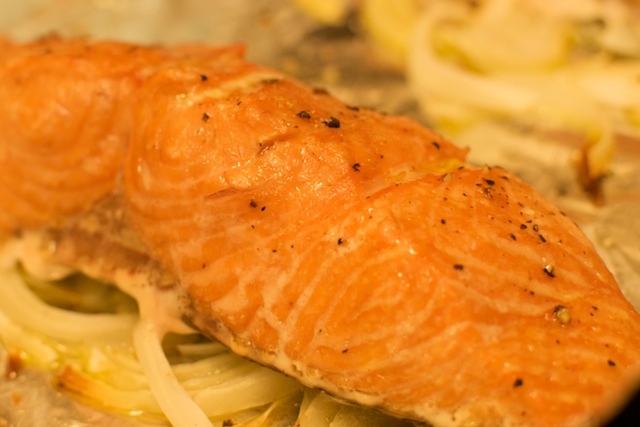 Take salmon fillets, sprinkle on salt and pepper and some brown sugar. Cut up some onions, lay then on the pan and drizzle with some olive oil. Then put fish on top of onions. Bake in a 250 degree oven for 30 minutes or until a knife inserted comes out easily. You can make this with basically whatever flavors you want, you can use oranges or sprinkle with lemon juice or soy sauce. When Drew and I were on our honeymoon in San Francisco, I had the opportunity to try several different macarons at a couple of different san francisco bakeries and I was hooked! There are a wide variety of flavors from chocolate to rose to pistachio and they were all yummy! However, I haven’t been able to find any here in the OC so I figured I’ll just make them myself! This past Sunday, Shannon came to visit so it seemed like a perfect opportunity :) I had read online about how difficult they are to make and how it’s probably best left to the pros, but the cookies only required 5 ingredients, all of which i had already, and the ganache also only 3 ingredients so there really wasn’t any reason not to try. 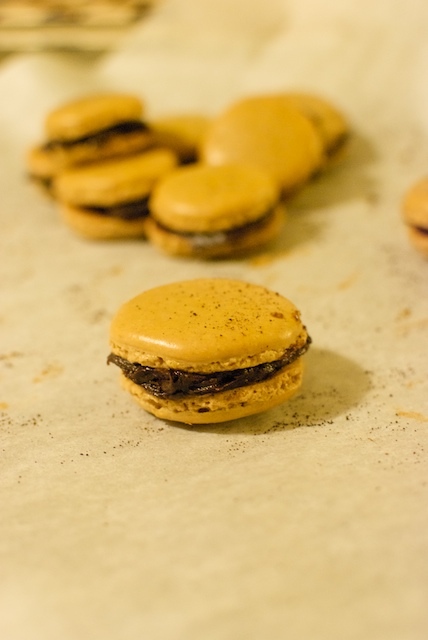 The recipe I used comes from a site called Italian Food Forever, it is similar to most other macaron recipes I found, I just liked the idea of nutella chocolate ganache :p I’ve also added my bits of advice in the recipe. *leave the egg white out uncovered for 1-3 days. Apparently this dries them out a bit to reduce the moisture. -grind almonds and coffee with powdered sugar until it’s finely ground, sift to separate the larger pieces, then grind them again until finely ground. May have to repeat a few times. -put egg whites in a large bowl, using a hand mixer mix until foamy. Then slowly add sugar and whip until soft peaks form. -most recipes use a pastry bag but you can accomplish the same thing by using a ziplock. Just put the batter into the ziploc, then cut off a corner and voila! -put a piece of parchment paper on the baking sheet, you can also use a silicone baking sheet, but mine came out better on parchment than on silicone. -while you’re waiting, preheat oven to 280 degrees and position a rack in the middle of the oven. -once the batter has set, bake in oven for 15-20 minutes. Be sure to check at 15 since oven temperatures vary and they will crack when overcooked. -let cool before trying to remove them from the pan. -heat cream in sauce pan until steaming, remove from heat, add chocolate and nutella and stir until melted and mixed in. 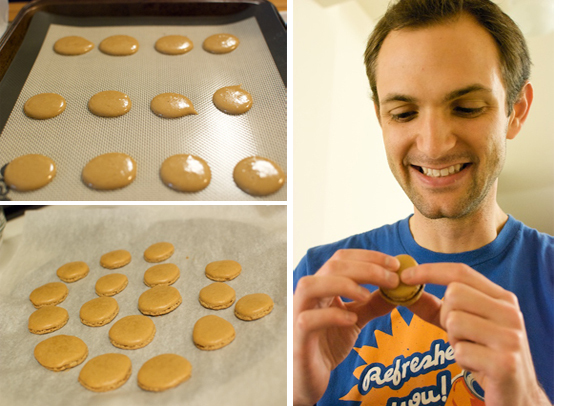 -refrigerate for an hour or so until solidified, then spread onto cookies to make little macaron sanwiches and enjoy! I have to admit that about half of my cookies came out beautifully, but the other half cracked or sunk in. I think that baking them on parchment paper was better than silicone and that letting them sit longer before baking was better as well. If you try making them, let me know the results and pass on the tips. No matter how they looked, though, all were delicious! I would say that of all the news sites that are out there, the new york times is the only one that I read on a consistent basis. I like how it’s updated with all the super important news, but that it also has equally good style / travel / entertainment / and food sections. I frequently find recipes in their food section that are made with simple and seasonal ingredients. 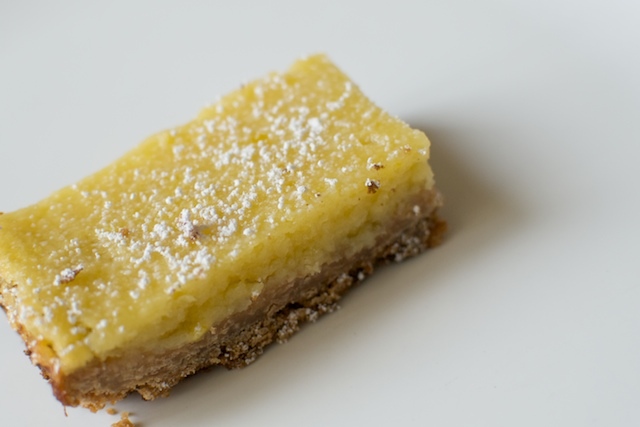 This tart recipe is from Mark Bittman, who is famous for his “how to cook everything” book series. It’s simple, easy, and by the account of friends, delicious! I’ve reprinted the recipe below, the only changes I made was I used almond meal instead of ground almonds and half and half instead of cream. 1. Heat oven to 400 degrees. In a bowl, combine eggs, sugar, salt, ground almonds, cream, sliced almonds, lemon zest and juice. 3. When tart is done, put it in broiler for about a minute or until just golden on top. Sprinkle with powdered sugar, let cool a bit, then serve. You are currently browsing the recipes category at Things An Likes.